Think back to when you were a child visiting your grandparent's home. Do you recall a distinct scent when you walked through the door? Many people do and it turns out, it's not just in your head. Gerontologist and author of A New Wrinkle: What I Learned from Older People Who Never Acted Their Age, Dr. Eric Shapira, says it is difficult to pinpoint the cause or one main reason for the smell; it is a process of what happens to the body as we age. Many studies show that the body's chemistry changes from within as we get older producing a certain scent. Some may describe it as musty. Some may call it stale. Maybe a bit medicinal. Here's the surprising part: Grandma or Grandpa may smell different. But, they don't smell BAD. A recent research study done by Johan Lundström of the Monell Chemical Senses Center published in PLOS ONE tested the odors from the underarms of middle-aged adults and the elderly. The result? Middle-aged men smelled the worst, according to those surveyed. The good news? Grandpa was considered second-best, and actually pleasant smelling. Middle-aged women came out on top of the list of most-enjoyable body odors. The study was conducted by attaching absorbent pads to the lining of the armpits of shirts. The shirts were then worn by volunteers of various ages for five consecutive nights while they slept. In order for other smells not to seep when the shirts weren't being worn, they were stored in sealed plastic bags during the day. The volunteers were also required to use scentless soaps and shampoos during the experiment and not to eat or expose themselves to strong smelling external things like perfume or cigarette smoke. After the five days were up, the pads were collected and placed in sealed jars ready to be opened and sniffed by other volunteers to judge the smelliness and to see if people could correctly identify the general age of the person who wore the pad (young, middle-age, and old-age). The results? The volunteers were able to correctly identify which pads were worn by old people most of the time, though that was about the extent of the accuracy. While they did also detect a distinct difference between the middle-aged and young, they were not able to accurately identify which was which in most cases. So what exactly is thought to be causing this change in smell as we age? It's still somewhat up for debate, but it is thought that there are many factors involved. One factor, according to the aforementioned physician, Eric Shapira, is simple dehydration. Older people tend to be less thirsty, which results in them being predominately more dehydrated and shedding more dry skin. Dead skin cells can carry a musty smell. In addition, Shapira notes that older people see a decline in oral hygiene over the years due to less efficient brushing. Oral hygiene, of course, can also affect one's scent. All those old books and papers, old linens and clothes — they all harbor dust and dampness and give off a musty odor that can pervade the whole house. If you moved into that house in 1945, those books may have been there for 60 years. I've seen drapes that have been there that long, too. Here's another odd thing about the changing of how we smell as we age: as we grow older, nearing age 80, males tend to smell more and more like women, with this change thought by some to be hormonal based, though exactly what's going on isn't yet perfectly clear. In the end, scents are a funny thing. We get a whiff of cologne walking through the mall and it can take us back to an ex in high school. The smell of leaves burning or grills fired up in the backyard can bring back memories of good times with friends and family. The smell of an elderly person, which has now been proven to be different but not bad, leaves us with an invisible question mark hanging over our head. Will we smell that way one day? Will our grandchildren wonder as they hug us what exactly is that scent? Will our grandchildren's clothes smell like us after staying over for a night? 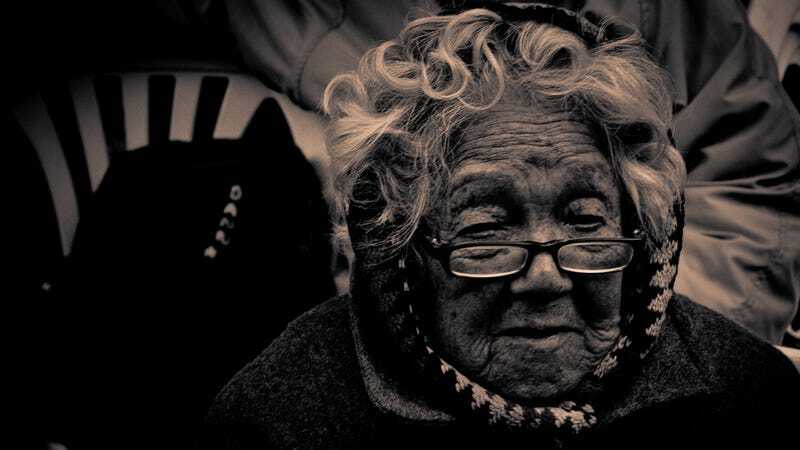 Having a distinct odor as an older person seems to be a part of the human cycle of life. It's what happens. Our grandparents experience it. Our parents will, we will, and so will our children. The best we can do is embrace it, be kind about it and take pride in knowing that it's not the worst scent out there. Remember, that 'honor' went to middle-aged men. Let's hear it for Grandpa. The Japanese have a word for old person smell: kareishuu. Similarly, scientists have known for years that a broad range of animal species, including mice, deer, otters, rabbits, and monkeys, undergo changes in body-odor as they age. The animals use these scent changes to help select mating partners. Deborah Honeycutt writes for the wildly popular interesting fact website TodayIFoundOut.com. To subscribe to Today I Found Out's "Daily Knowledge" newsletter, click here or like them on Facebook here. You can also check 'em out on YouTube. This post has been republished with permission from TodayIFoundOut.com. Image by Gustav´s under Creative Commons license.